Help Air Force Times and other Military Times publications honor our veterans with the launch of #MyVeteran. Beginning today, use the hashtag #MyVeteran in a Google+, Twitter, Facebook or Instagram posting to recognize any veteran in your life. You can post photos, videos and any messages using this hashtag. The postings will be featured on our website at militarytimes.com/myveteran. We hope the collection will grow to honor thousands of veterans by Veterans Day on Nov. 11. Militarytimes.com/myveteran will be live until Nov. 30. Many of the postings will also be featured in the Nov. 18 issues of Air Force Times, Army Times, Navy Times and Marine Corps Times. To be considered for publication, your post must be submitted by Nov. 4. 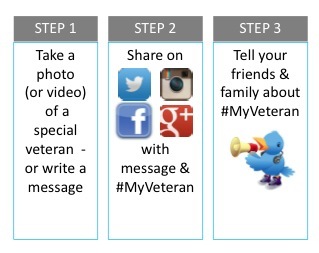 Let’s get #MyVeteran trending across these social networks TODAY to celebrate the veteran – or veterans – in your life.